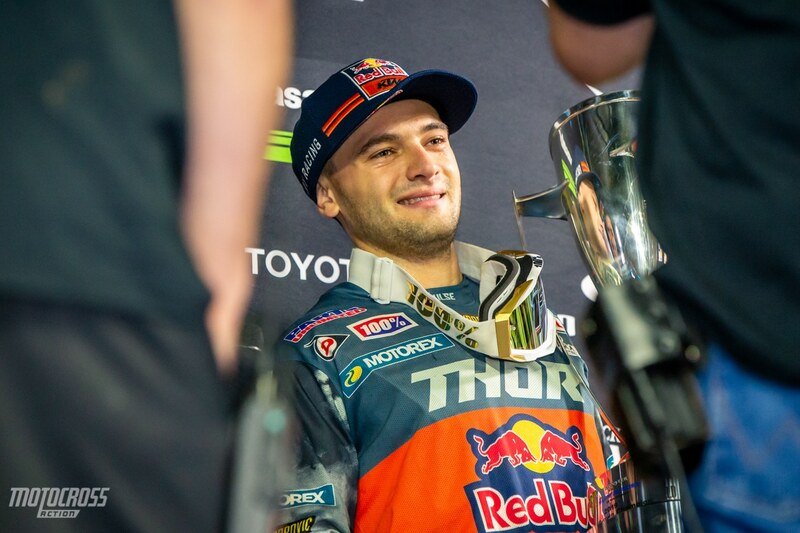 Cooper Webb holds up his Houston Supercross first place trophy and his Triple Crown “championship within a championship” trophy that he didn’t even know he was competing for. 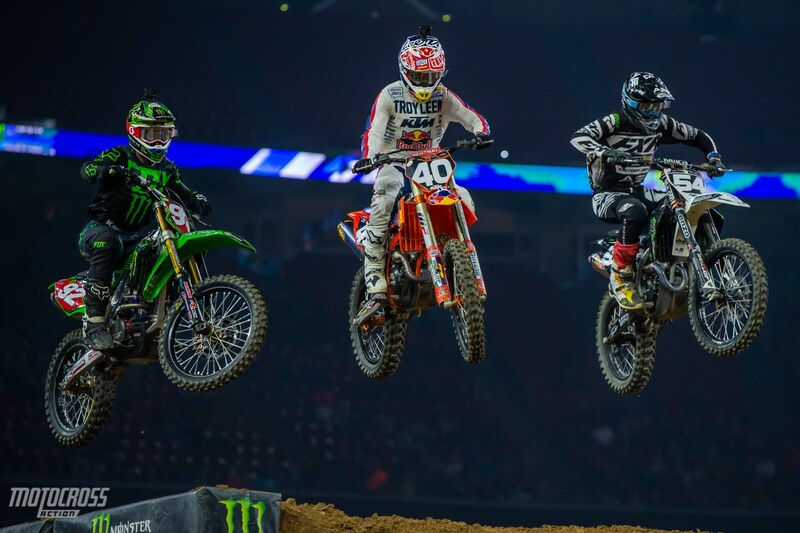 Houston did not disappoint as it provided yet another night of intense racing. 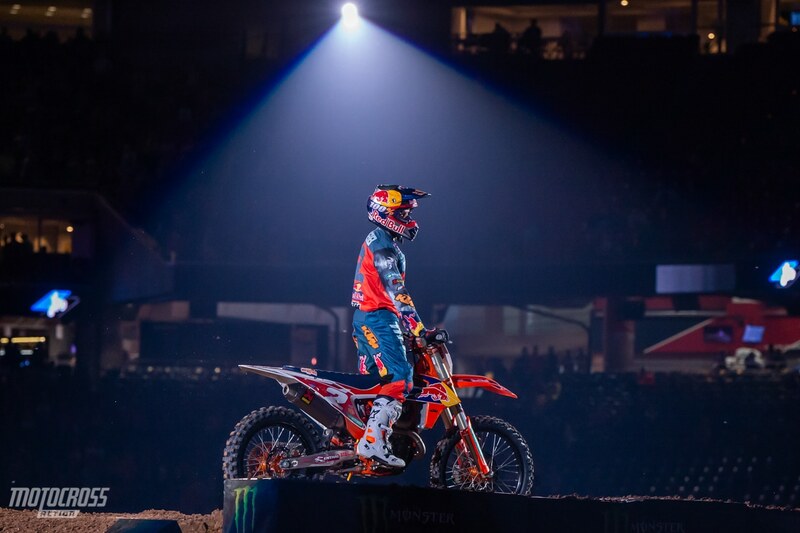 While the two Red Bull KTM teammates have kept the racing clean up until this point, finally at round 13, we saw sparks go flying. 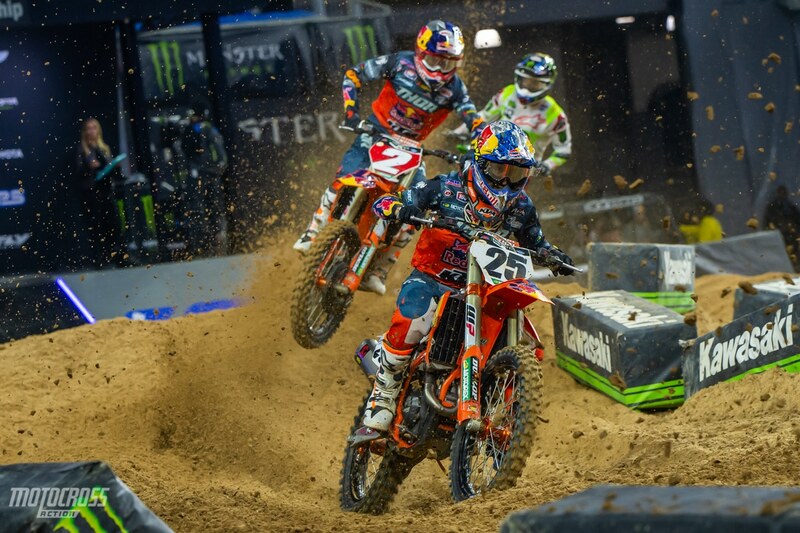 Marvin Musquin dove up the inside of Cooper Webb to make an aggressive pass and Cooper retaliated by making a couple of aggressive attempts at passing Marvin before eventually pushing his teammate off the track. Ken Roczen started the night off great, he grabbed the holeshot and rode away from the pack in the first 450 main event, sadly, Ken went down on the start of the second main event which caused him to DNF the race. He returned for the final race, but he was only able to salvage an eighth place finish. 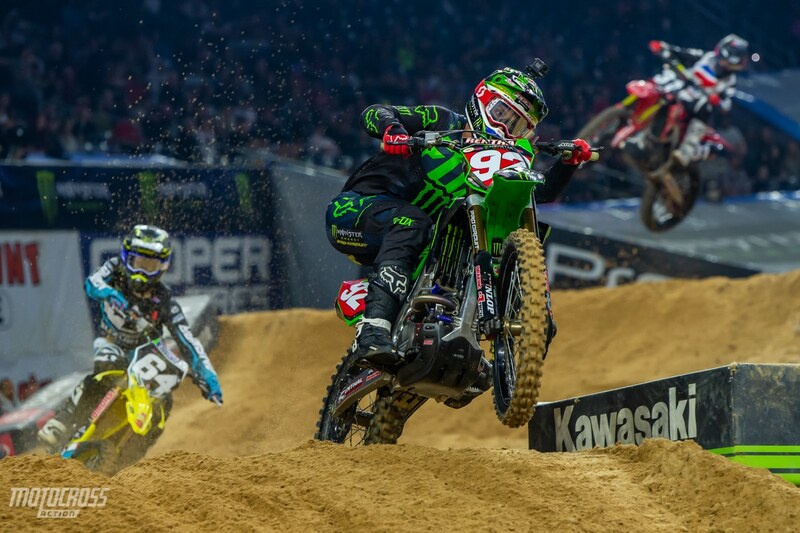 Eli Tomac seemed to be off the pace all day, but he finally turned it around in the third main by finishing second. Cooper Webb also won the Triple Crown championship that he didn’t even know about. 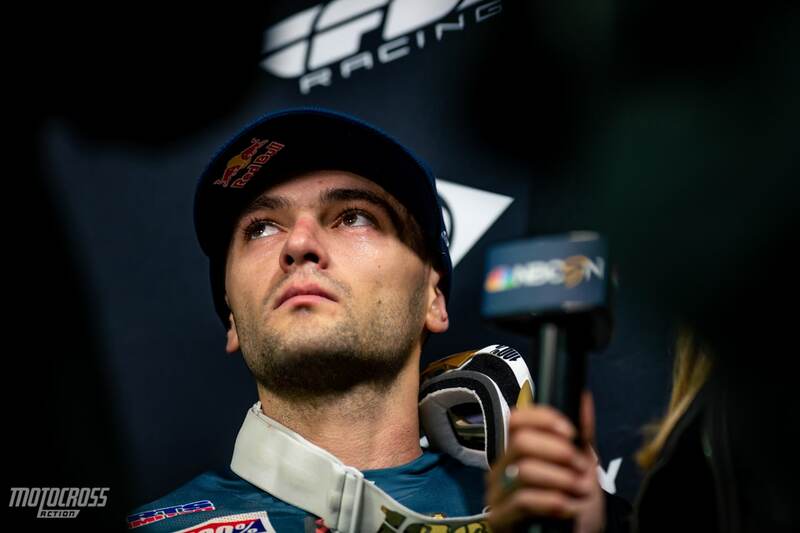 Most fans and riders didn’t even know, but the three Triple Crown races were considered a championship within a championship and despite not even knowing about it, Cooper Webb won it. 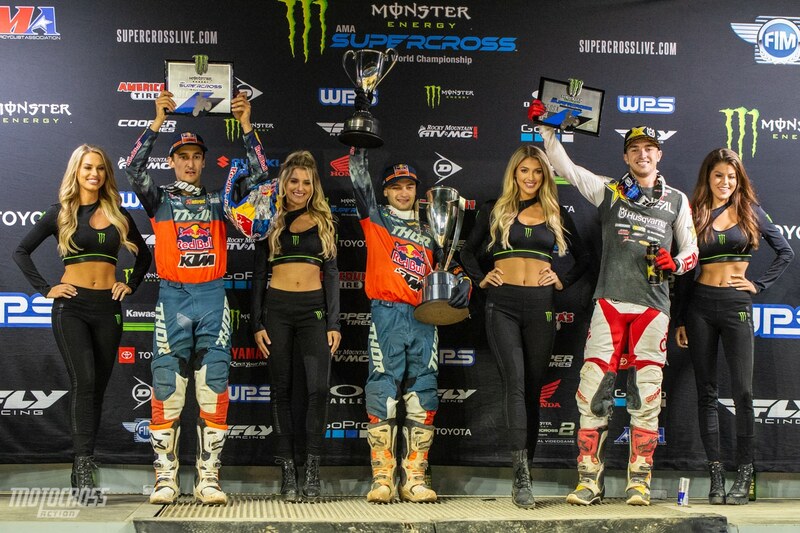 After 13 rounds of clean racing between the KTM teammates and training partners, the gloves finally came off in Houston. 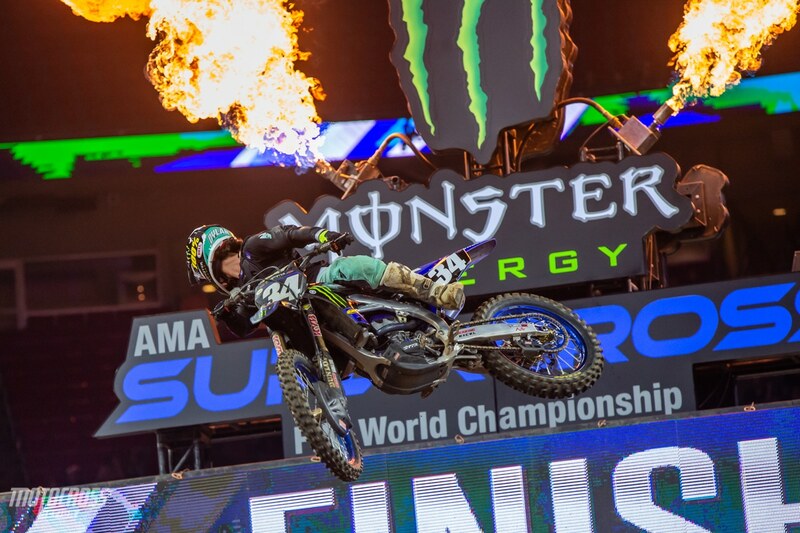 Cooper Webb has matured a lot in 2019, but the aggressive first-lap pass that Marvin made on him, lit a fire in his eyes. He was seeing red in the first main event and he was out to prove to his teammate that when push came to shove, he was going to have the last shove. When any other rider would’ve waited for decent opportunity to make a pass, Cooper drove deep up the inside of his teammate and made room where there wasn’t any room by pushing Musquin straight off of the track. 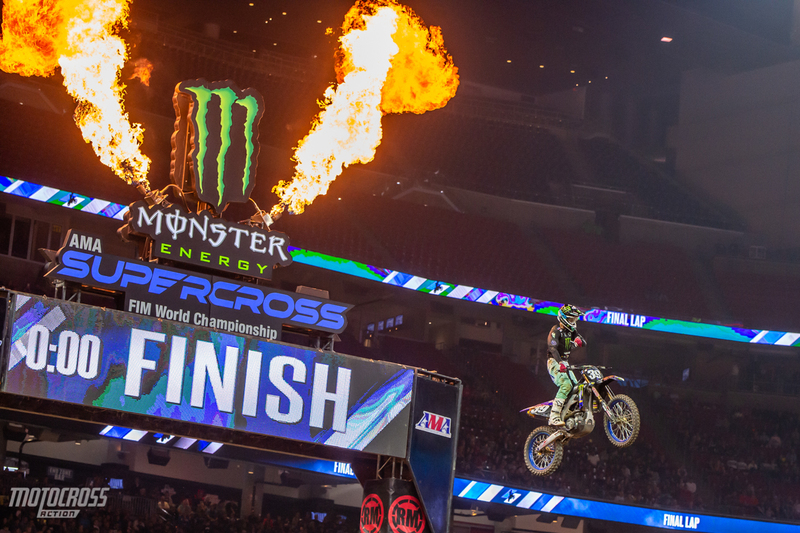 Dylan Ferrandis made it two in a row as he won his second Supercross ever! 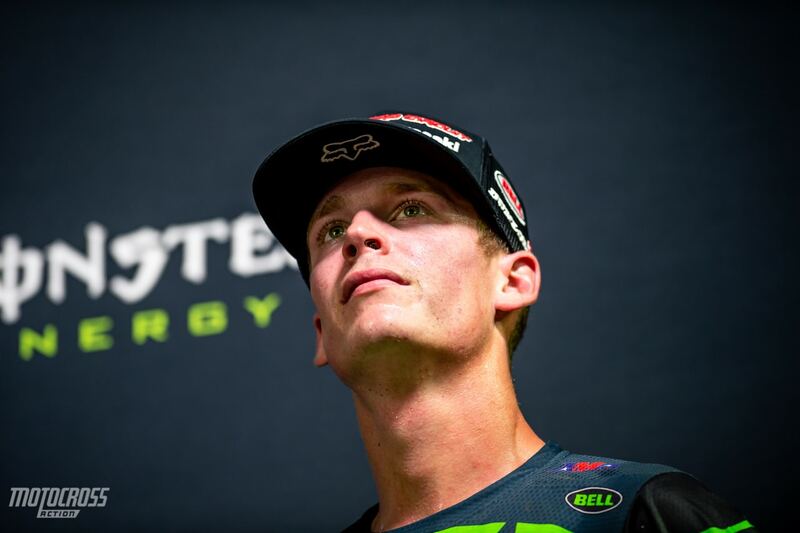 Also, with Adam Cianciarulo’s 4th place, the Frenchman was able to shrink the 250 West points gap from 12 points down to 5. Things are really starting to heat up with two rounds to go in the 250 West division. 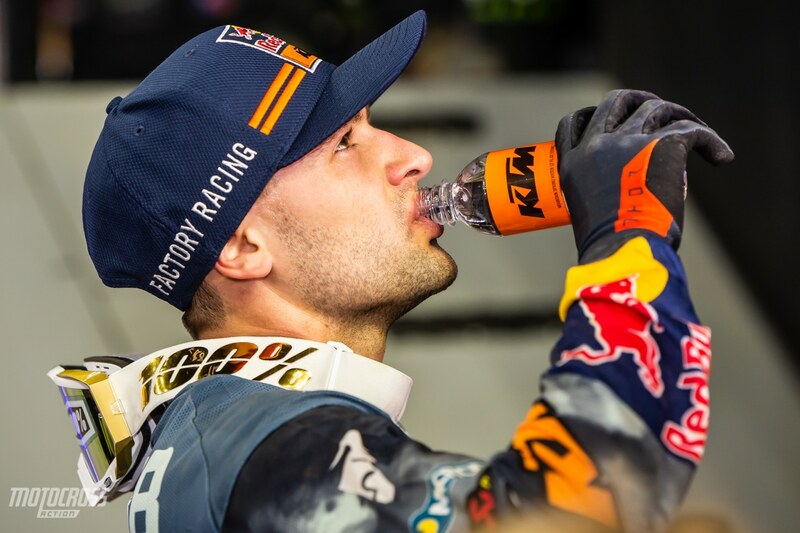 Cooper Webb is in a tough position, he’s the new guy on the KTM team and the new guy at the Baker factory. Plus, nobody expected him to be winning races and leading the Championship this year. But now with four races left, it’s Cooper’s Championship to loose. When asked about the aggressive racing between he and his teammate Cooper admitted that he made mistakes and he got frustrated. He said that he will try to learn from it and try to contain his emotions a little bit better next time. 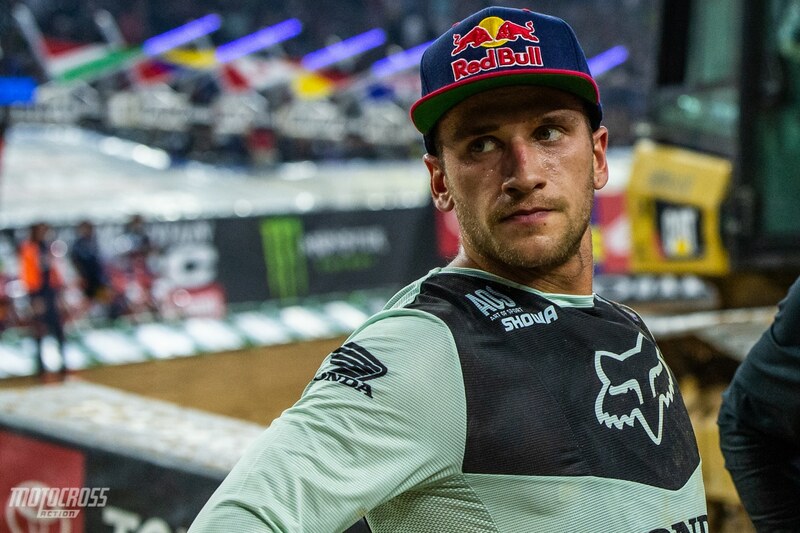 Eli Tomac’s 6-7-2 scores in Houston were good enough for 4th overall, but not good enough to gain on Cooper Webb in the 450 Championship point standings. 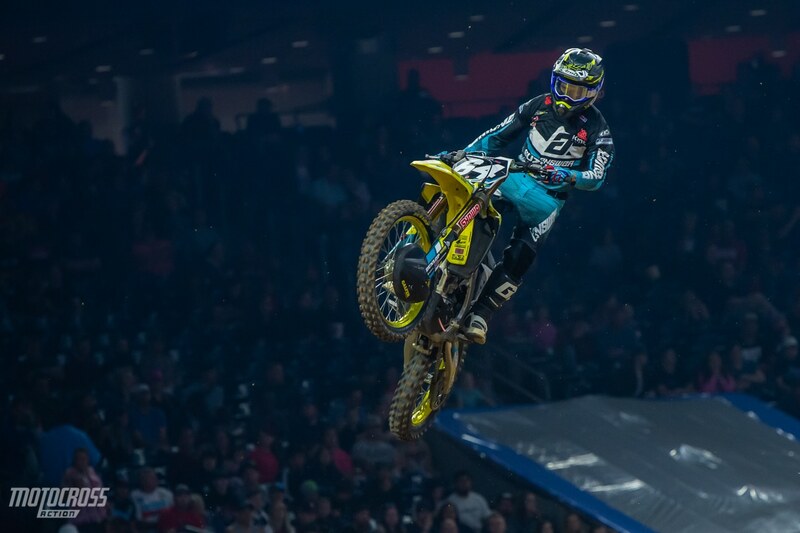 Now that he’s 26 points behind, it’s going to take a huge mistake from Cooper Webb for Eli to get back into the battle for the number one plate. 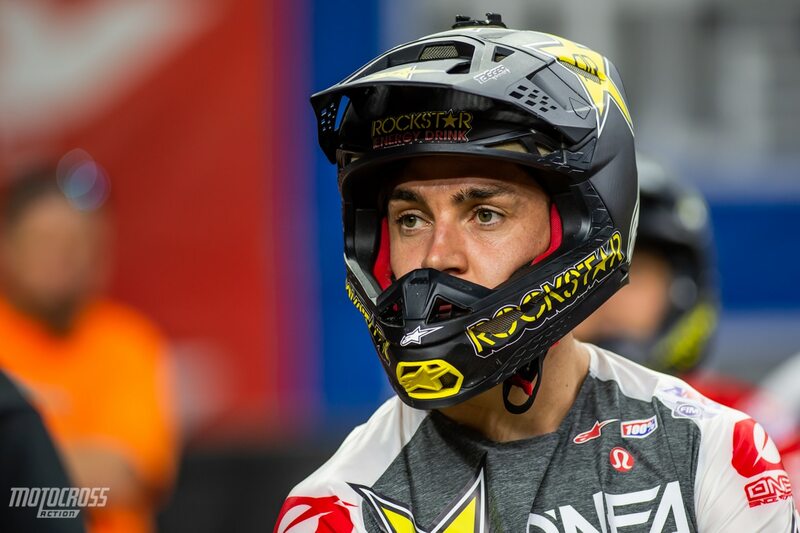 Dean Wilson: “All season it’s like you have your ups and your downs, but you got to keep going, keep going. It’s crazy because all of these guys here in the 450 class, and the 250 class, are so fit and fast, so what’s really going to separate? It’s pretty gnarly. So, it’s just a little bit more of a mental game for me, because I feel like I’ve been bucked off the horse quite few times and it just messes with my brain a little bit. Sometimes I don’t believe in myself like I should, but it’s something I’ve been working on. I want to give a big shoutout to my support group, they’re the ones who really help me through this stuff. It’s tough, it’s funny watching from the stands, but when you’re on the starting line it’s the most intense feeling ever and sometimes I just think too much. 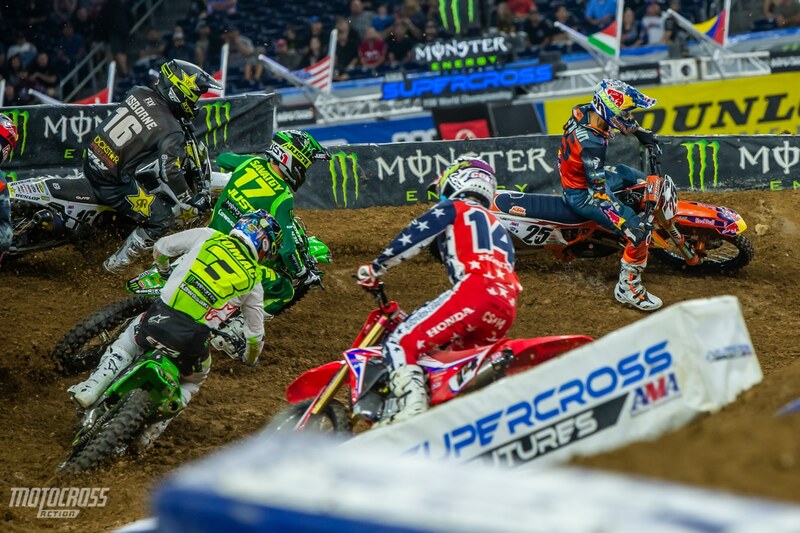 Starts are very important in Supercross, and they are extra important at the Triple Crown events. The races are shorter, instead of a 20 minute + 1 lap main for the 450 riders, they compete in three 12-minute mains. This means more starts and higher intensity riding. When the riders in the post-race press conference were asked about the three race format they all agreed that they liked it to some degree. But most of them were on the same page in believing that it was good to split it up and use the Triple Crown format sometimes, but not anymore than they already do. They liked having three Triple Crown events spread throughout the season, but most of them didn’t want to add more Triple Crown races. Cooper Webb said that he preferred the standard format, and also that it was nice to switch it up sometimes. 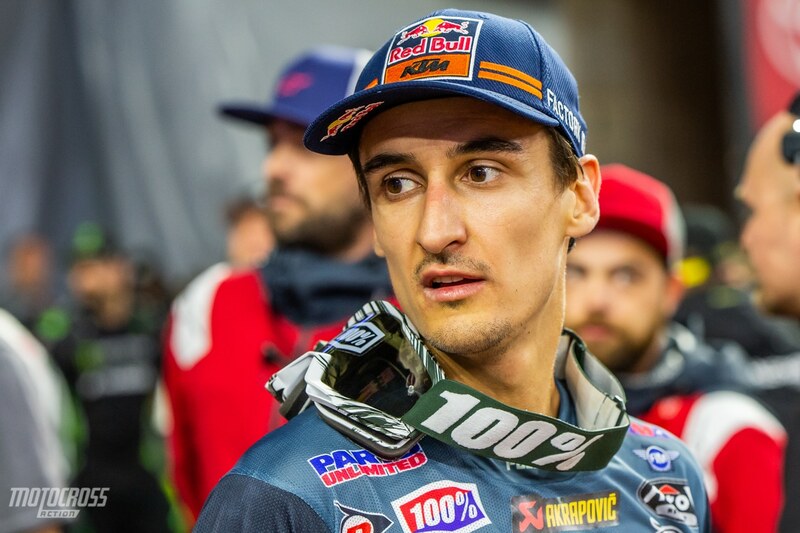 Both Marvin Musquin and Dylan Ferrandis stated that it was harder for the mechanics because there is little time in between each race to service the bike. In Houston the pits were further away from the stadium than most making it even more challenging. 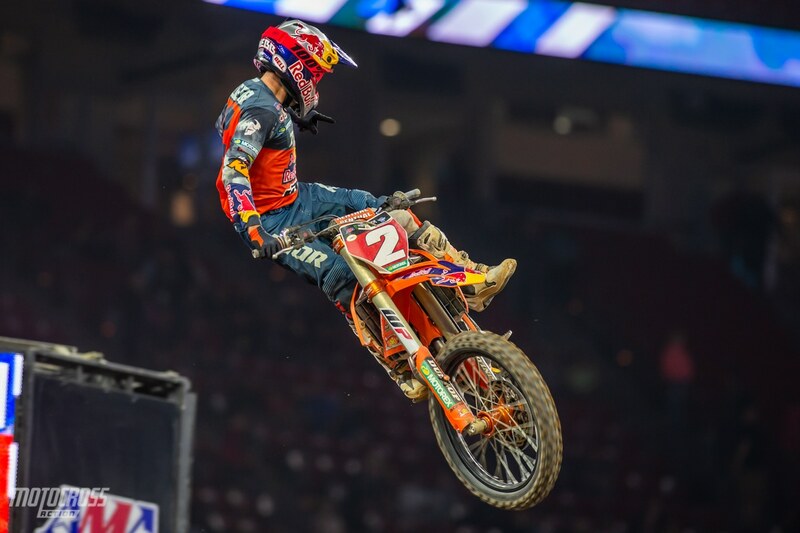 Ken Roczen was on a roll in the first main event, he grabbed the holeshot and while Cooper Webb and Marvin Musquin were pushing each other around, they slowed down. This allowed Ken to pull a 10-second gap on the rest of the pack. After loosing his cool and pushing his teammate off the track in the first main event, Cooper Webb calmed down for the rest of the night. He grabbed the early lead in 450 main event two and rode a consistent race to win by 3 seconds over Dean Wilson. In the third main, Cooper ran second for a short while before Eli Tomac made the pass. Cooper then settled in to finish the race and win the overall and with 2-1-3 Moto scores. 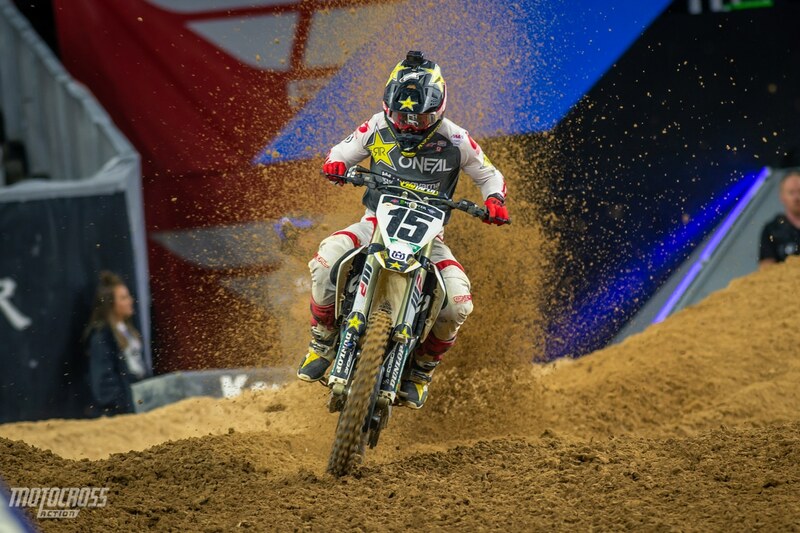 Dean Wilson charges out of the sand section in Houston. Dean’s 3-2-5 scores were good enough to earn him his first podium since Indianapolis in 2018. 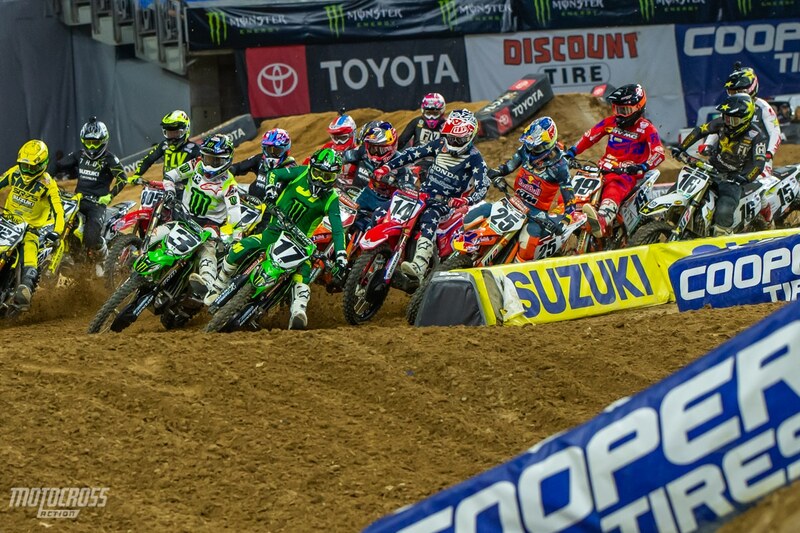 Racing is close on the opening laps of any Supercross race. When you put the top 22 riders in the 450 and 250 classes on the track for a shorter main event, three times in a row, the risk factor is much higher. The Triple Crown races are more intense and exciting for the fans, and also more challenging and dangerous for the riders. 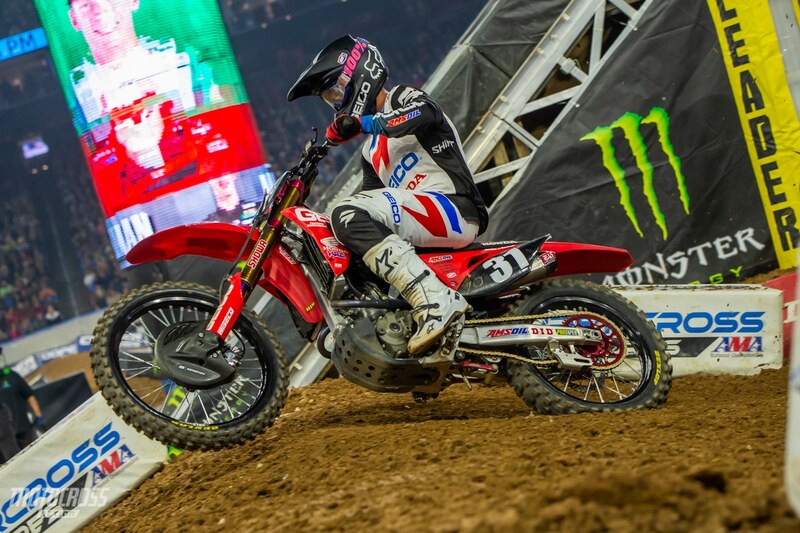 Cole Seely’s 4-4-11 moto scores weren’t consistent, but they were good enough to earn him 5th place overall in Houston which is Cole’s best finish since his big injury in Tampa last year. 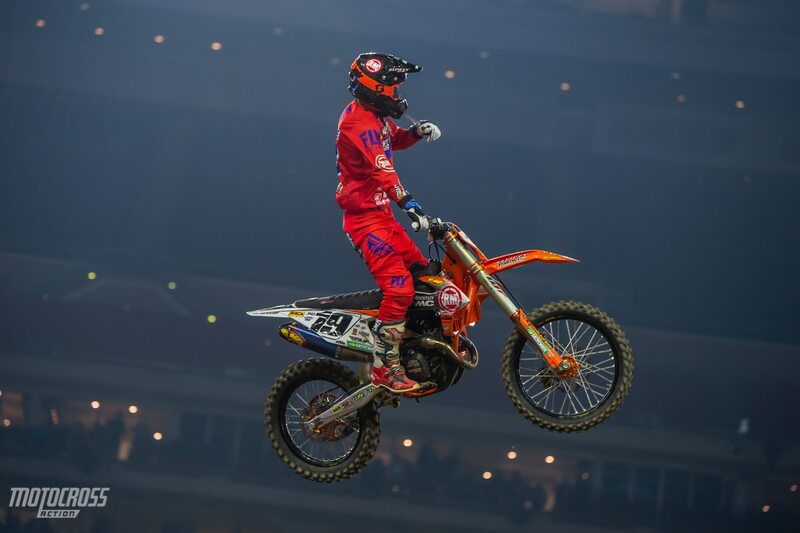 Here Marvin Musquin attempts to jump through the whoops. The whoops were tough all day, but the fast riders were still skimming through them most of the time. The whoops in 2019 have developed in a way that many riders are choosing to jump through them rather than skim so it was a change to see riders skimming whoops all throughout the night. As we’ve said before, Zach Osborne is improving each weekend. 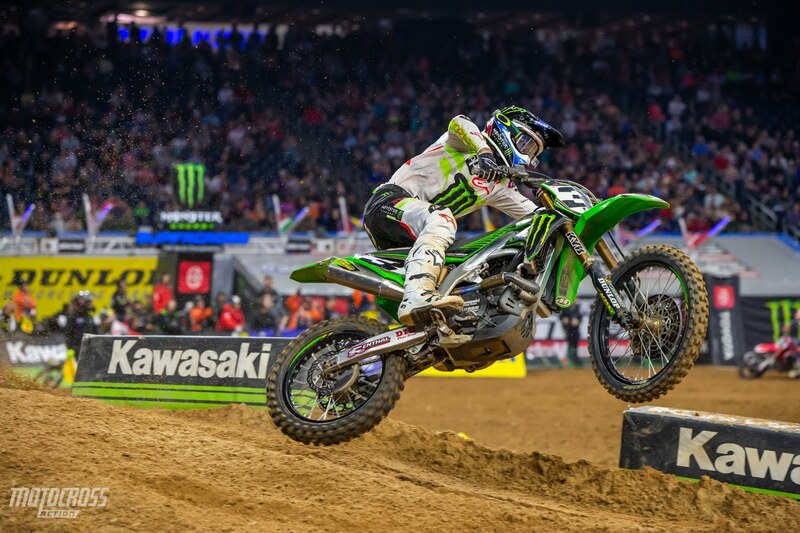 He showed some brilliance in Houston, especially when he passed Eli Tomac in the second main. His 10-6-4 scores were good enough to earn him 6th overall at round 13 and that result ties his best finish of the year so far. 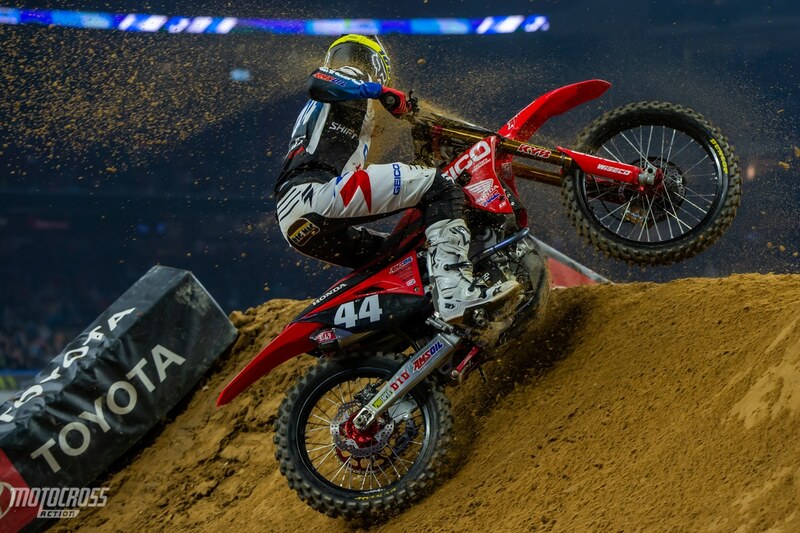 Justin Bogle had a great night in Texas. 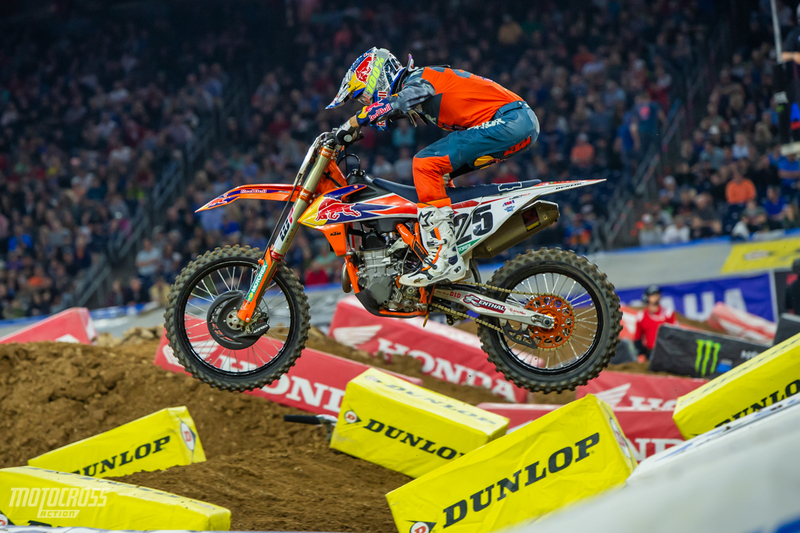 With only riding the KTM a handful of times before the season started, it has taken some time for Bogle to become fully comfortable on the new color. 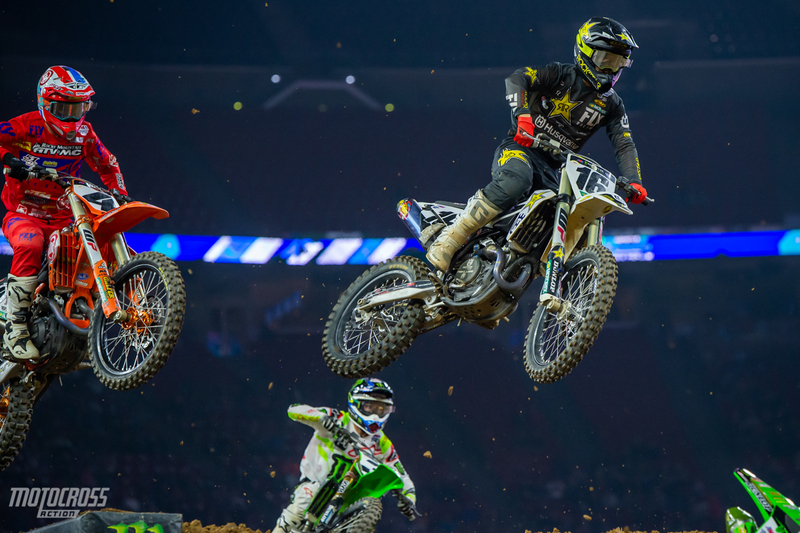 With 8-5-7 finishes at the Triple Crown in Houston, Justin Bogle showed great potential and placed a solid 7th place overall. 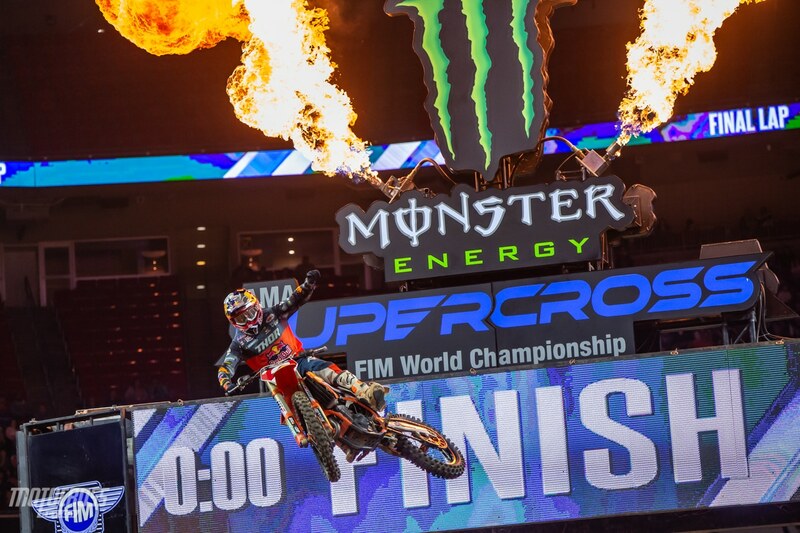 Cooper’s win in Houston helped him extend his Championship lead to 16 points over Marvin Musquin. With four rounds left Marvin is hopping his teammate will crack under pressure and make a mistake. Dylan Ferrandis grabs his second win ever, just one week after his first win ever! 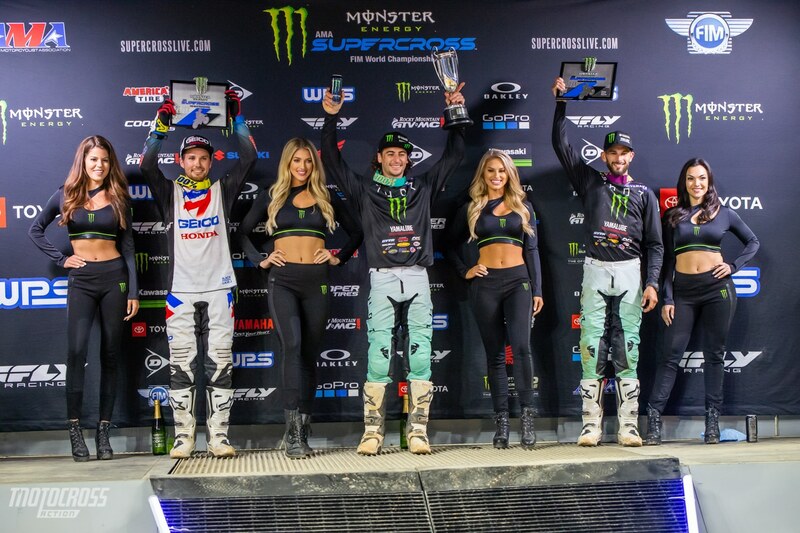 Colt Nichols joins him on the podium for the first time since Oakland and Rj Hampshire grabs his first Supercross podium since his rookie season. 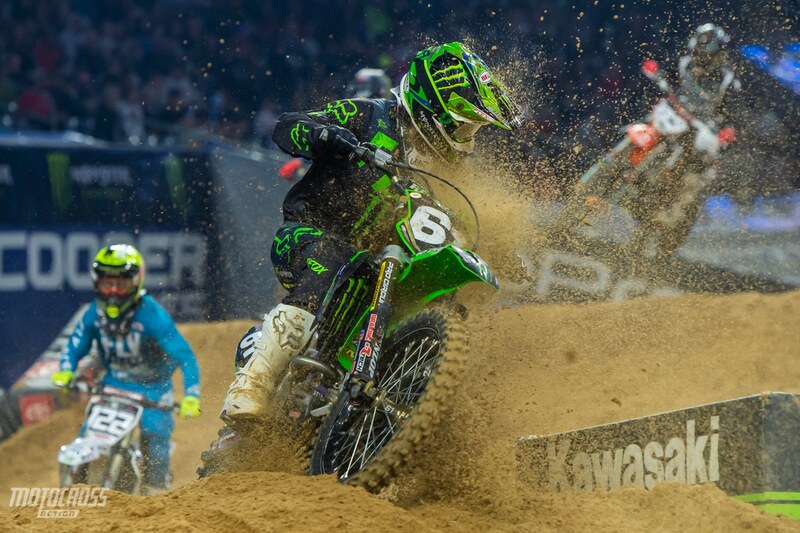 Adam Cianciarulo was riding fast all day in Houston. He set the fastest lap time in qualifying and he won the first main event comfortably. The night started to come apart in the second main event though. He launched off the track on the start, and then while running 6th place on the second lap he went down and dropped to last. In the third main event he had more issues, but was still able to charge his way up to 3rd. His 1-10-3 scores gave him 4th overall. 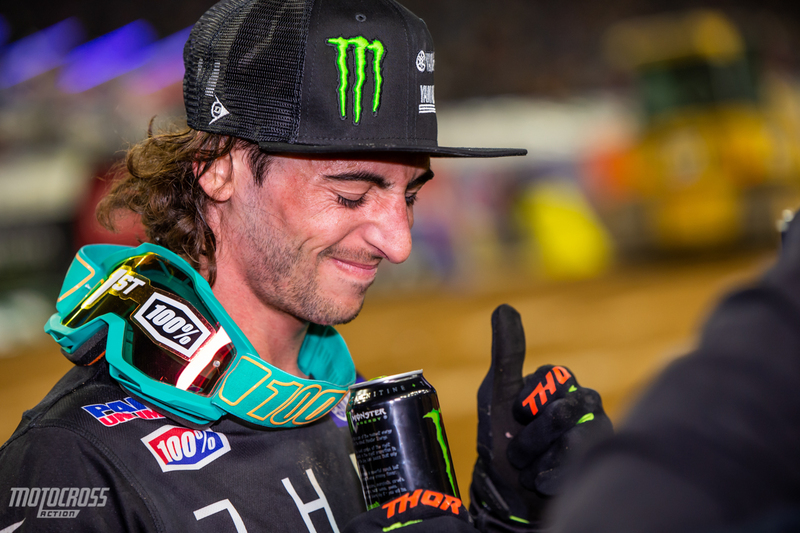 The three-race Triple Crown format played into Dylan Ferrandis’s favor. He capitalized on Adam’s mistakes and made the most of his night by taking the win. It will be interesting watching these two go at it in Denver and Vegas. 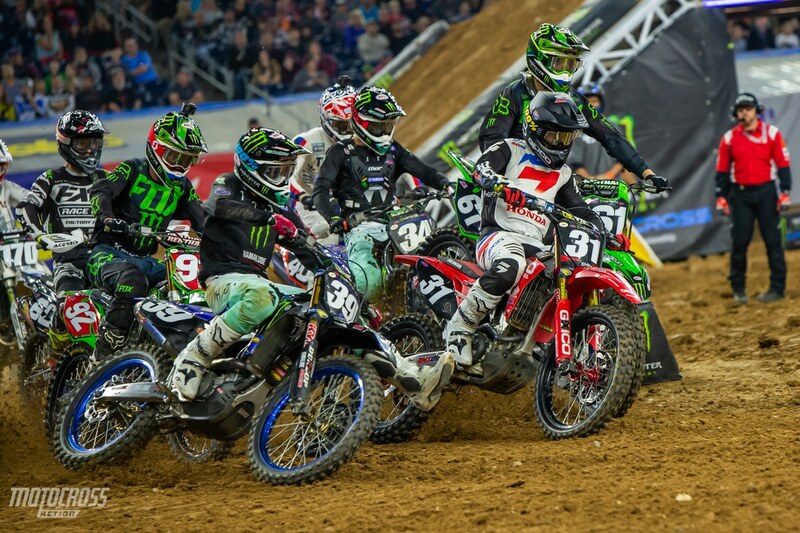 The third 250 main event start resulted in another first turn crash. This time it was Garrett Marchbanks #61 on the inside who had nowhere to go and ran into the back of Rj Hampshire. This caused Garrett and a few others to go down. Many people have complained about the 90-degree first turns this year and it’s understandable as we’ve seen so many crashes in them. Colt Nichols lit the fireworks with a win in the third 250 main event of the night. Even though it wasn’t an overall win, this was Colt’s first main event win since the last 250 West Triple Crown at Anaheim 2. There he won the first main event but finished third overall. Rj Hampshire turned his season around with a third place in Texas. 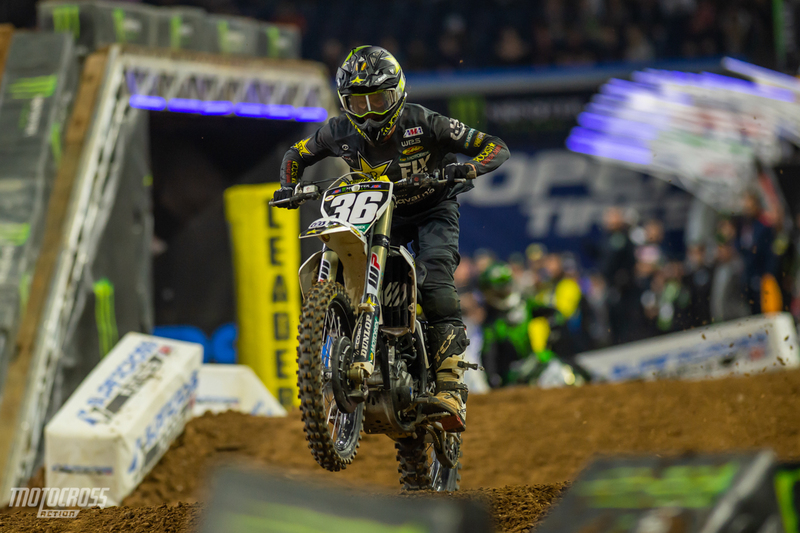 His podium finish boosted him up to fourth place in the 250 West championship point standings. Jimmy Decotis launches the wall jump into the sand section. Jimmy’s 6-5-6 moto scores earned him 5th overall on the night. 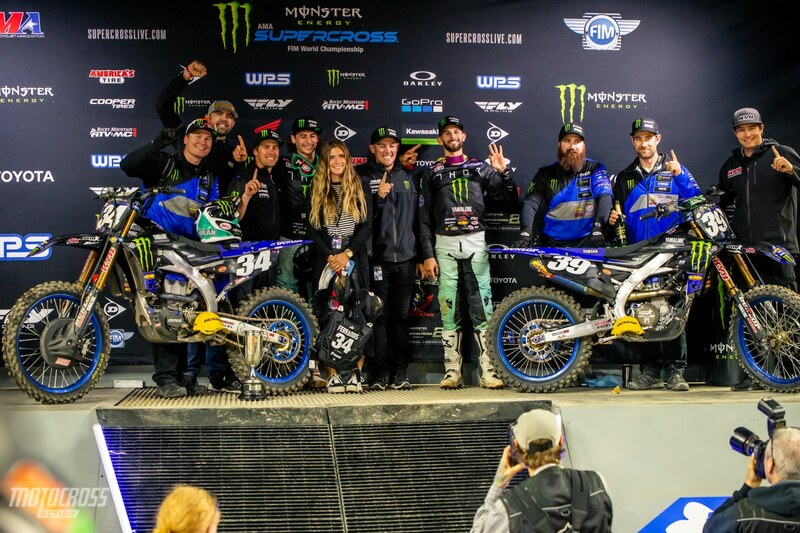 The Star Racing Yamaha crew has risen to the top of the 250 ranks as one of the most dominant teams in the last few years. 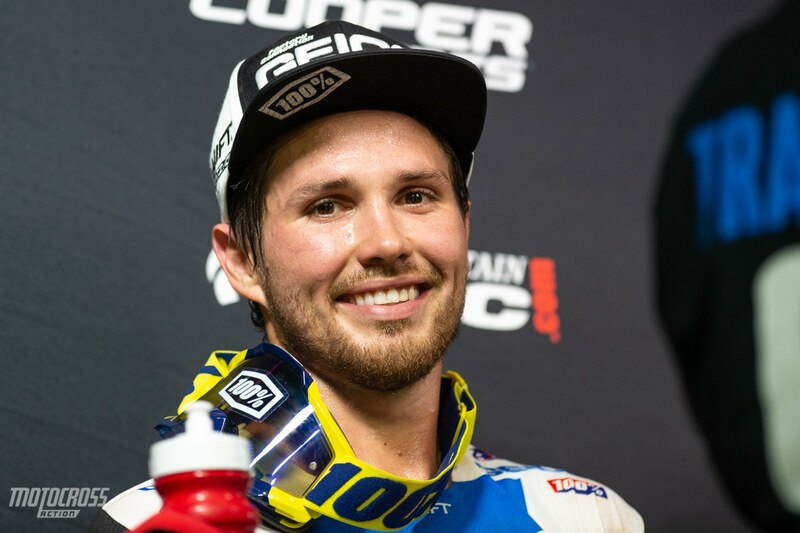 With riders like Jeremy Martin, Cooper Webb and Aaron Plessinger winning Championships on the team, it’s clear they are doing something right. 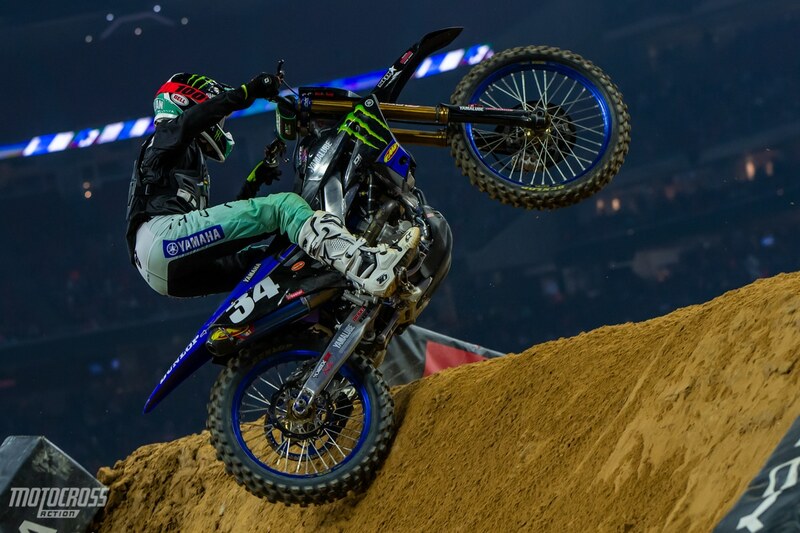 The Yamaha 250 boys did well again in Houston with Dylan Ferrandis taking the win and Colt Nichols placing third. 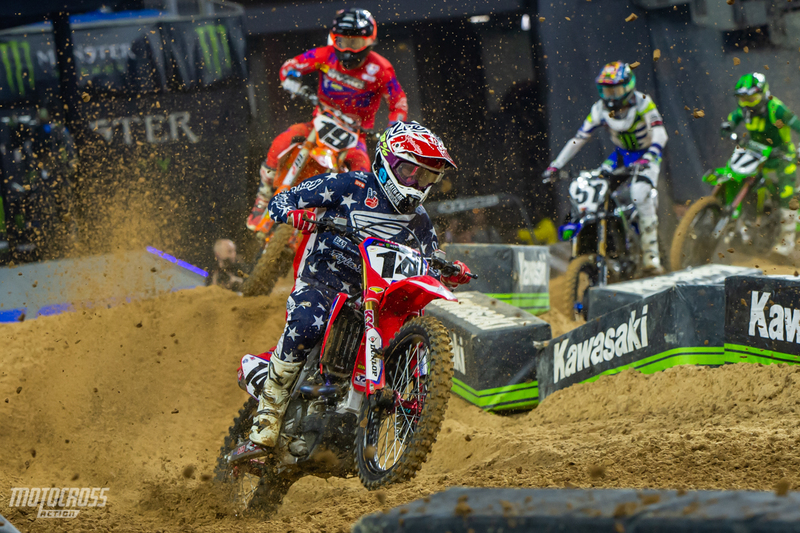 The 250 West riders will have two weekends off before the battle for the championship resumes in Denver, Colorado, a new venue for Supercross. This photo was taken just a split second before Adam Cianciarulo connected with Sean Cantrell mid-air and went down in the second 250 main event of the night. Adam’s bike was down on the back side of the steep over-under jump. The riders couldn’t see him down on the other side and Adam had to dodge multiple riders as they were still jumping the table-top and almost hitting him. With AMA rules, riders are still allowed to jump under yellow flag circumstances, just not under red cross flag situations. Justin Starling hit Adam but luckily Adam bounced right off, stayed on his feet and was ok. Then Chris Howell ran into Adam’s bike and went down. After all the carnage, the points leader got up, and charged his way back to finish 10th in the race. Michael Mosiman started off well on his Rockstar Husqvarna. He grabbed a good start and battled at the front of the pack in the first main event to finish 4th. 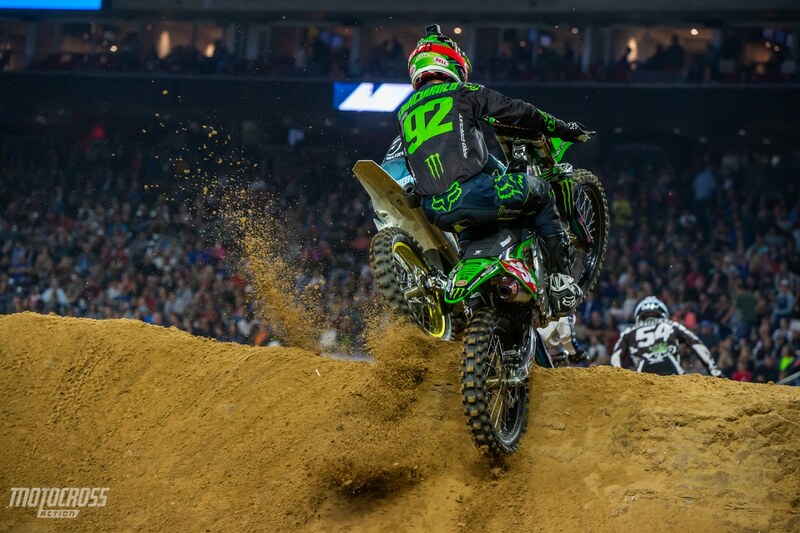 Unfortunately crashes in the second and third main events set Mosiman back and gave him 12th overall in Houston. Part 1: Cameron McAdoo gets a face full of sand as his comes over the wall jump. Part 2: McAdoo gets more sand to the face. The sand section in Houston looked really cool for the fans watching, but photos like this show you how difficult sand sections are for the riders. The sand sections almost always develop only one line and if you’re behind someone you can’t see because you’re covered in a wave of sand. This makes it harder to pass and battle through sand sections. Dylan Ferrandis plays in the Texas sand. 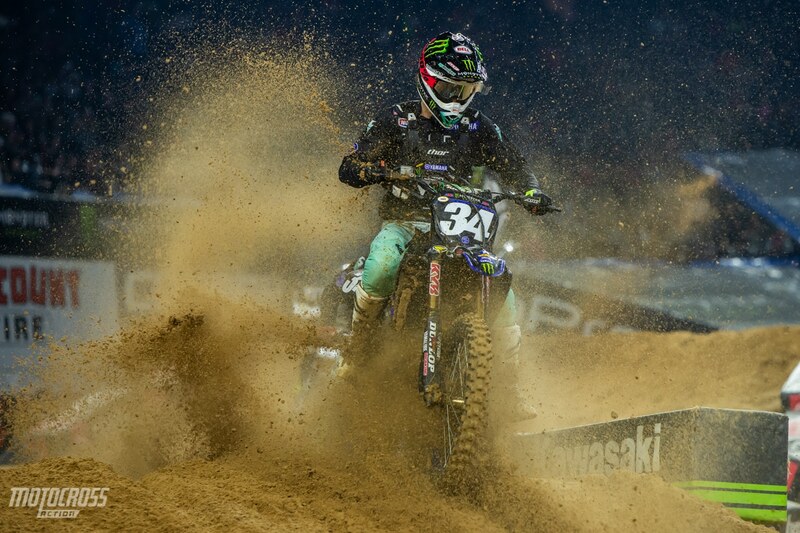 Garrett Marchbanks looks away in an attempt to save his goggles. 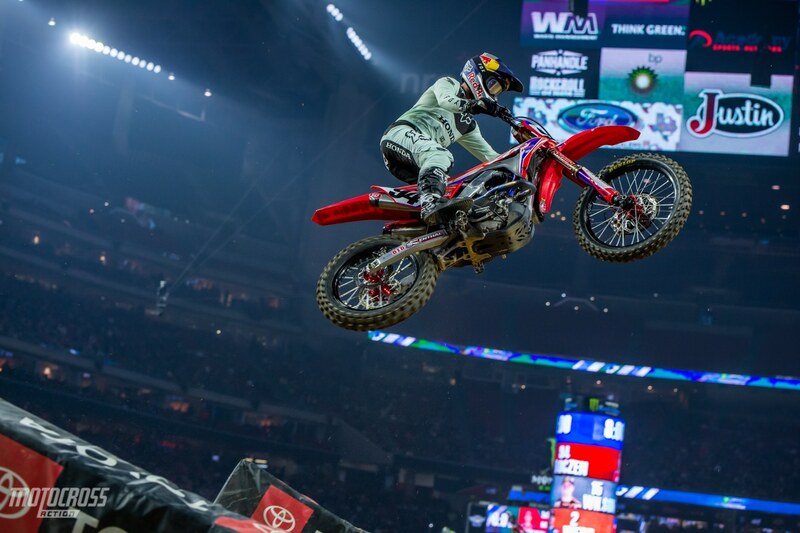 Going into the final four rounds of Supercross, the spot light is on Cooper Webb. 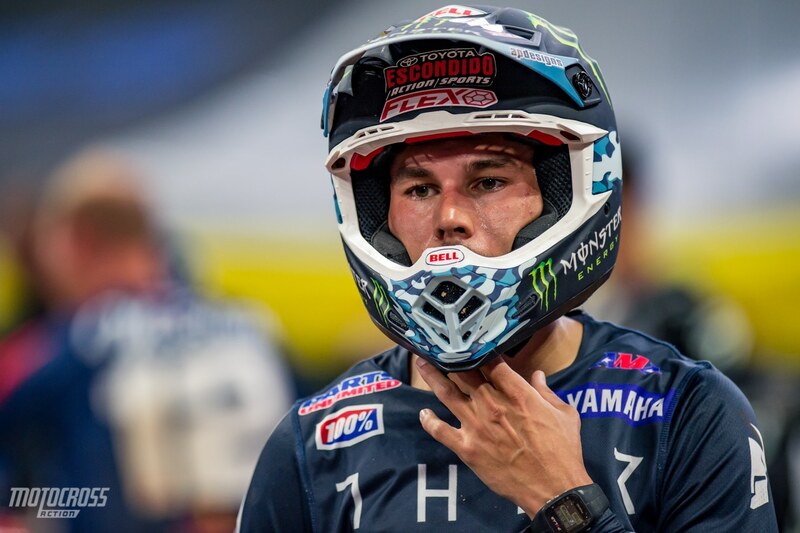 It sure will be interesting to see if the young 23-year-old from who has ridden a Yamaha for his entire Pro Career can win a 450 Supercross Championship in his first year on a KTM. 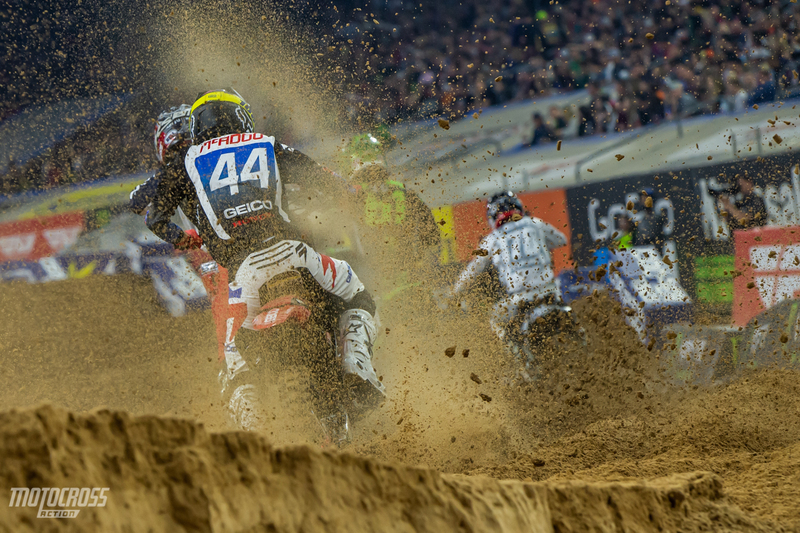 Keep checking back in with Motocross Action for all things Supercross.